We’d love your help. 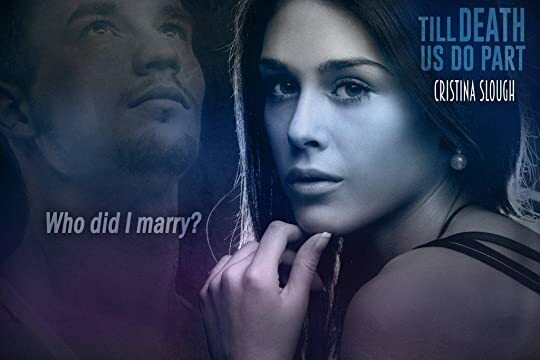 Let us know what’s wrong with this preview of Till Death Us Do Part by Cristina Slough. The wife of a U.S. Marine, Mimi spent countless nights worried that her husband Joel would fall in the line of duty. He had fought valiantly and served his country with honor. That's exactly what they tell her when they deliver the news-Joel was taken by the enemy in Afghanistan. Her husband is dead. The closer Mimi grows to the Marcus family, the more she considers it home. But when suspicions of Joel's past surface, Austin refuses to disclose family secrets-even to his brother's widow. It's only by accident she uncovers evidence of Joel's tainted past. Devastated by his lies and betrayal, she slowly opens up to Austin, and together they unfold layers of pain and grief. Just as Mimi finds new hope in a future with Austin, Joel returns home from war. Enraged, traumatized, and teetering on the edge of insanity, Joel confesses to a history of deception, revealing yet another secret-this one too terrible to forgive. To ask other readers questions about Till Death Us Do Part, please sign up. This book isn’t what I expected. And I don’t mean that in a mean way. The beginning was a little bumpy, but over all, it was all there and pretty cohesive. For an author debut, this book tugged at my heartstrings. I can’t imagine what goes on in the head of a military spouse and their significant other. It cannot be easy. Getting into Mimi’s head and witnessing the shock, the pain, the anguish or losing her husband and also the pain and confusion she feels when she learns later that he was after all alive was intense. My heart felt heavy for her. Then add on top, the chilling fact that her husband is not the stand up man she thought he was. That was pretty mind-boggling and alarming. AND, since that Mimi has now moved on from her husband and is dating his brother-- after reaching out to the latter, believing that her hubby was deceased—and therefore embarking on a relationship with that other. It was pretty up and up to see how everything unfolded. In some ways, I feel that this book was about finding your inner strength, finding your center and standing on your own two feet when you feel your world crumbling down. It was about love, friendship, forgiveness, rediscovery, and ultimate sacrifice. The ending, wah, that was definitely not how I thought it would end. It was unexpected. Certainly, not your typical book ending, that’s for sure! Non-HEA book disguised as a romance book. Complimentary copy received via the author for an honest review. Thanks! WOAH! This book is definitely an emotional read and has many twists and turns that will keep you gripping the pages (or your kindle). This is a great debut novel by Cristina Slough, and I am very excited to read more by her in the future. Romance lovers beware though, you don’t exactly get the happily ever after that you so crave with this one. There is also a bit of a love triangle. But please, d Complimentary copy received via the author for an honest review. Thanks! WOAH! This book is definitely an emotional read and has many twists and turns that will keep you gripping the pages (or your kindle). This is a great debut novel by Cristina Slough, and I am very excited to read more by her in the future. Romance lovers beware though, you don’t exactly get the happily ever after that you so crave with this one. There is also a bit of a love triangle. But please, don’t let this stop you from reading it. There is so much more to the book than these things. Like, true love overcoming lies and deceit, finding happiness when it feels like all hope is lost, and some serious twists that will leave you an emotional wreck! Gahh, it was really good! This book is about a woman named Mimi whose husband is in the military. When he leaves to go to Afghanistan Mimi is a wreck, rightfully so. Anyone who has a husband or family in the military knows how heartbreaking and scary this can be. Anyway, not too long into their marriage Mimi is given some terrible news- her beloved husband has been captured and killed. Emotional and distraught by this news, Mimi feels like she must go to the home of his brother to find out more about her husband, Joel, and his past. You see, the two are estranged and she needs answers as to why. But upon doing this, Mimi learns of some terrible secrets that could ruin her thoughts of their marriage for good. Two brothers, one woman, lies, and deceit. This book will take you on an emotional rollercoaster leaving your breathless in one moment and angry in the next. This is a spectacular debut novel- one that should be read by many. I highly recommend this one! Please note that this is my personal opinion and in no way whatsoever is it to be taken at face value. Different strokes and all that. This is a very promising story and it isn’t written badly. The writing style isn’t for me and it comes over as way too jilted and choppy. Unfortunately today I also tried to start it for the second time and it just isn't sucking me in grabbing me and saying read me, read me. I know that this book can’t be written in entertaining way but it is really depressing. I Please note that this is my personal opinion and in no way whatsoever is it to be taken at face value. Different strokes and all that. This is a very promising story and it isn’t written badly. The writing style isn’t for me and it comes over as way too jilted and choppy. Unfortunately today I also tried to start it for the second time and it just isn't sucking me in grabbing me and saying read me, read me. I know that this book can’t be written in entertaining way but it is really depressing. I love emotional and I go do sad but I can’t do depressing. There is the whole I lost my husband part which is tragic but if you are caught up on someone that much is it believable to hook-up with the brother? II knew this beforehand when reading the blurb but the beginning is hard and out of fairness to the author it just wouldn’t be right to read it, rate it and review it. I wish the author all the best for the future. Joel is getting ready for his deployment to Afghanistan. This will be his second tour, and the first as a married man. Mimi and Joel have been married a month, and understandably she is a little nervous for Joel to leave her side, but even in her worst nightmares she never thought he wouldn’t come back. Joel was taken prisoner in a foreign country and declared dead. Mimi is lost…looking for direction…when she decides to visit the family ranch where her husband spent his years growing up. Joel never spoke fondly of his brother, Austin. There was a discord in the family stemming from years ago and the blame game weighed heavily on their familial separation. 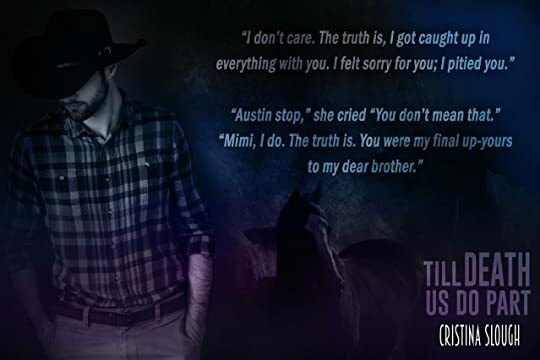 Now when Mimi is looking for closure in Joel’s death, she wants to go to the place that holds so many memories of him --- the family ranch where Austin resides. It is here where she finds secrets of the man she married. Mimi felt her heart stop. Her mouth felt dry and suddenly she couldn’t find the words she needed. Mimi is discovering not only did she not know the guy she married, she really doesn’t like him. The secret he was harboring was vile. Austin is helping Mimi adjust to this new-found information, and Austin is also accepting the fact that he is attracted to his brother’s widow. Just when Mimi is gaining strength from her grief and betrayal, she finds herself once again knocked on her bottom with the knowledge that Joel is alive. Joel knows that by now Mimi has probably unearthed his secrets. He is going to have to work hard to earn Mimi’s forgiveness. Austin doesn’t even have to work hard – he is just naturally a good guy tackling burdens at a young age when nobody else was willing to step up to the plate. Betrayal versus goodness. Mimi knows the final decision in her heart but yet it may not be in her hands. This was a well-rounded story told from all character points of view in third person. I enjoyed the military aspect of the story and I especially enjoyed the love interest of the brother stepping in. The premise of this book was promising but the story (for me) didnt deliver. The book is quite wordy and at time over descriptive. The plot is and one that we have read probably several times but what didnt work for me was the over emotion. There was just too much and the ending but just eye rolling over the top. I had to DNF this one at 30% in. The writing style of the author and I just didn't mesh. I even did the worse thing possible, skipped to the end to see if I could push through, but that made it even easier for me to say "forget it.". I don't want to get into the characters too much here, because I don't want to spoil everything for those that might be interested in reading this book. But just as Mimi learned that Joel wasn't who she thought he was, the reader does as well. While I found some of it to be believable, some of it wasn't believable for me. The man he was later on in the book was so different from the man we first met, and while I do think part of that was real, there were some things that just felt completely out of character. I liked Mimi well enough, but I didn't feel connected to her. While I was interested to see what would happen, I just didn't feel fully invested in her story. Same with Austin. I liked him and there was so much more to the story than we had been lead to believe from Joel, but I never truly felt like I was in this one. It felt as though I was removed completely and as though I was an outsider looking in. I wanted to really feel emotionally connected here, and I just wasn't able to. I think part of that was the writing style. It just wasn't for me and often felt choppy. I think that because it was so choppy it was hard for me to get into the story as I might have been able to otherwise. The other thing that bothered me was the ending. I won't go into details or spoil anything, but as much as I struggled throughout the book I had really been hoping for an ending that would have made that struggle worth it. For me, this ending wasn't that at all. It wasn't satisfying and I was really disappointed with how things turned out. I respect the author and her vision, but personally had I known the way things would go I would never have started this book. To me it wasn't a romance, and it honestly felt like a lot of what happened here was done for shock value. It just didn't fully ring true to me with the rest of the book, and I wish that I had known ahead of time and saved myself the time. I do think that there are readers out there that will enjoy this story, and if it sounds like something you are interested in, you should give it a shot. Just because this book wasn't for me doesn't mean that it won't be for everyone. I don't even know where to start with this book. Right from page one I was hit with the writing style of this book. It felt like I'm being told what to read instead of the story just unfolding naturally. I think that's why this book was kind of slow for me. It took me awhile to get into. Another thing I wasn't feeling was all the 9/11/ Afghanistan war talk. Yes... I was expecting a little about it. But overall it just kind of killed the mood of the book for me. When names and places were mentioned. I semi checked out. And I think it just came down to the writing style.... How it was all told. Because at times in this book just felt like details overload. Why do we need to know what kind of hair flattener Mimi uses? Or how she pairs her outfit. Or just how Austin cooks his meal. Little details like that always feels to me like filler. As I kept reading it was starting to feel like one of those If it wasn't one thing it was another thing in this book. And I felt like that the most with poor Austin! He got the raw end of the deal with EVERYTHING in this book! Right from the start Mimi was so wishy washy about Austin. Yes she was grieving. But I felt she jumped too quickly with Austin. He was a straight rebound for her I felt. And after everything Austin had been through because of his brother. I just felt so bad for him! Because I truly felt Mimi could have really set him back and brake him emotionally. The insta love going on in this book was just too dang fast!! Austin was saying I Love you to Mimi in only a week! Maybe 2 weeks tops of knowing each other. And at least one of those weeks she was still grieving the death of her husband! I think it would have been more believable if they have spent more time together getting to know each other and letting all their walls come down. Let it all unfold naturally.... them coming together and falling in love. Because... the way she picked Austin I felt wasn't right. At times this book was so chaotic. Joel being pronounced dead by the military. Mimi falling off the horse. Joel coming back into the picture. And the topper for me was the whole Meg thing!! It was kind of weird. And it almost felt like it was thrown in at the last minute for added drama. Then to come find out it happened more than once!!!!! I was kind of done by this point! I was so pissed! Then we have Joel's whole new personality! He totally just came unglued. Yeah... I just wasn't feeling it. The ending... I hated it! I mean. Really! I really wished I had known this book wasn't going to end in a HEA. Maybe I wouldn't have minded if I just wasn't so irritated by all the other stuff going on in this book. Like I said earlier in my review....Poor Austin! He didn't deserve the ending he got. I felt after everything Joel put Austin through... He should have gotten a different ending. Overall... This book just wasn't for me. There was just something about this book that drew me in. I was perusing the Tasty Book Tours site and kept coming back to it and so I signed up. The premise intrigued me and had me a bit frightened. I was certain that there could be nothing but heartache in this read. That is mostly true, but not entirely (but mostly it is true). There is A LOT of drama in this story - characters aren't who they seem. I believe we are meant to love Mimi, but she makes some questionable choice that lead to ending you won't forget. At the center of the story are Mimi and Joel Marcus, Austin and Jake Marcus, and Mimi's friend Meg. Each and every character has a story here. But really, this is Mimi's life we are following and we are promptly plunged into the life of a young wife contemplating life as newlywed living without her husband due to the war in Iraq. Slough does an amazing job capturing that feeling of the desperation of a military wife with a husband deployed. Initially the story goes back and forth in time, introducing us to Mimi and she reflects on being with and without Joel. We learn a bit about Joel and Mimi through their honeymoon and all I could feel was their love and adoration. When Mimi's world implodes, and Joel is declared dead in combat, her grief seems never ending. Mimi seeks closure and decides that showing up on the family ranch in Texas, meeting the brother that Joel hasn't spoken with in years, is the way to achieve this...huh??? At this point I have to stop and say that Slough wrote a fabulous story that made me feel, feel, feel- so very, very much. The twists and turns in the plot, taking Mimi and her friend Meg to the family ranch conjured up all kinds of feelings and misgivings. I can't write much more about the story without sounding like I'm judging Mimi. After all, I'm supposed to like Austin, right? Mimi does. I'm supposed to trust Meg right? Mimi does. I'm NOT supposed to root for the returning husband, because Mimi doesn't,?? Arghhhh!! But the thing is that by the end of the story I realize that I don't think Mimi is a very good judge in character. Till Death Us Do Part is cleverly plotted and will drag you're heart through the ringer, whether you have the same reaction to the train wreck that becomes Mimi's life or not. I have paragraphs drafted questioning Mimi's actions and feelings about Austin and Joel but I'm putting all that aside. But really, what did she think would happen??? I may be totally off in what I feel. My takeaway may not be the same as others and I honestly don't expect it to be. But any story that invokes this type of emotion from me, days after I finished it, is a read I'll recommend and hope you have your own unique take on it. *I was gifted a copy of this book in exchange for an honest review. This story felt a little slow moving and difficult to get into at first, but the more I read, the more engrossed I got. And as the story progressed, I literally had a hard time putting it down until I finished. And, what a finish! Brit Mimi met and married an intense U.S. Marine named Joel Marcus while he's in England. After a short honeymoon, he's sent back to Afghanistan. When Mimi gets the call that every military wife dreads and finds out Joel was taken by the enemy and killed during a missio This story felt a little slow moving and difficult to get into at first, but the more I read, the more engrossed I got. And as the story progressed, I literally had a hard time putting it down until I finished. And, what a finish! When Mimi gets the call that every military wife dreads and finds out Joel was taken by the enemy and killed during a mission, her life spirals out of control. She receives brief condolences from her brother-in-law in Texas, and takes it as a sign that she should visit her husband's childhood home and learn more about his past. She really only knows that Joel became a marine after 9/11 and left his family's ranch in Texas, leaving his mom and younger brother running the ranch all those years ago. Now it's only his brother, Austin, and his son who live on the ranch and Joel and Austin had been estranged for years. In fact, Mimi had never even met Joel's brother because he didn't come to their wedding. Mimi's best friend offers to travel to Texas with her and even though they find Austin less than welcoming initially, Mimi begins to feel at home in Texas and she adores Austin's son, Jake. But most of her questions about Joel's childhood go unanswered and Mimi begins to suspect that her fabulous hero of a husband wasn't all he seemed. And over time she finds herself growing closer and closer to Austin and Jake. Austin seems reluctant to talk about his brother, only explaining that he was never even invited to Mimi and Joel's wedding. As time goes by and her friend returns to England, Mimi chooses to remains in Texas. She and Austin develop a relationship, neither really wanting to move too quickly because, after all, Austin is her husband's brother and there is his young son, Jake, to be concerned about. But though Austin reminds her of Joel in looks, Mimi slowly realizes that Austin might just be a much better man. Just when their relationship is beginning to blossom, word arrives that Joel, though severely injured, is alive and will be well enough soon to return to Texas. Austin is torn about what to do and Mimi is horrified that her feelings for her husband have changed so drastically. I can't really say too much about the rest of the book without revealing too much, other than to say the ending and what leads up to it is startling and unexpected. This is definitely not your lighthearted romance and if you're looking for a happily ever after, this is not the book for you. But it is a fascinating look at relationships, deals realistically with some of the ramifications of war and is suspenseful, to boot. I think this author will be one to watch. ARC provided via Tasty Book Tours in exchange for an honest review. You can find more of my reviews at Carlene Inspired. Mimi Marcus spends her days in London, working and spending time with family, while she waits for her US Marine husband, Joel Marcus, to come home from deployment. They're each other's whole world and Joel's promised he will be coming home. Except, he's captured and killed and Mimi is left with nothing to connect with his memory. She embarks on a journey to get to know the husba ARC provided via Tasty Book Tours in exchange for an honest review. Mimi Marcus spends her days in London, working and spending time with family, while she waits for her US Marine husband, Joel Marcus, to come home from deployment. They're each other's whole world and Joel's promised he will be coming home. Except, he's captured and killed and Mimi is left with nothing to connect with his memory. She embarks on a journey to get to know the husband she has lost, starting in Texas with his younger brother, Austin, the sibling he's been estranged from for years. Once there she finds that nothing is as it seems, starting with why the two siblings haven't spoken in years. Underneath the surface, she's found secrets and lies in Joel's past, a man she's starting to think she never really knew. Austin, however, is everything Joel wasn't and when they recognize their attraction for one another, everything changes. Joel is alive however and his return is not one of happiness. With a lifetime of secrets between them, Mimi must choose between brothers, between the lies that tie them all together and the marriage vows she made to Joel. Mimi's character was everything I could want from a broken-hearted Military widow and more. 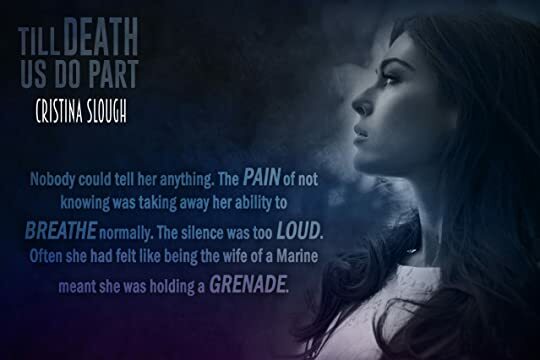 The experiences and thoughts she had made the story come to life to me, I felt like I could understand her and connect to her in ways I don't often with other Military novels. The emotions are heavy and I found myself hurting for her, especially once she discovers her husband is not the good man she thought he was. I enjoyed her determination to learn more about her husband, traveling across the country to see the family he had left, even if she'd never met them before. I loved the shock value of Mimi finding out that everything about her husband's past is opposite of what she'd heard. There are some twists that Cristina Slough threw in there that totally messed with my head and I understood how Mimi began to question everything she ever knew. Like Mimi did, in the midst of emotional despair people often turn to others with their feelings, and watching Mimi and Austin fall for each other felt so real. On top of the story, there was so much more to this book about love, honesty, and finding hope when everything seems lost. 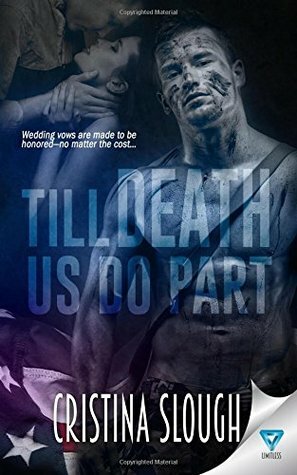 The premise of Till Death Us Do Part sucked me in, however the writing kept me constantly considering putting the book down and walking away. With multiple POV's and changing tense, it was incredibly hard to keep the characters and the story line in order. The book changes from past to present tense, and while it's distinct, the characters we see in the past do not feel like the same characters from the present. Especially Joel once returned from deployment, I felt like there should have been some hint in the past of just how off the rail he could be. It also didn't read like a romance, the entire book is emotionally heavy from start to finish, and while there is promise of hope and love, it isn't a light-hearted HEA many readers like to reach for. I enjoyed the general book, from start to finish, but there are more twists and surprises than I would generally want in any book. I'm kind of surprised by the mixed reviews this book received; I really enjoyed this story line! It takes a strong writer to have a reader move from loving to hating and then to sort of understanding a main character. That's exactly how I felt about Joel. I loved him in the beginning of the book: he was so kind and loving towards Mimi, his reasons for being a marine were heartfelt and he adored the ground she walked on. But then Mimi travels to Texas and meets Joel's brother Austin and his son Ja I'm kind of surprised by the mixed reviews this book received; I really enjoyed this story line! It takes a strong writer to have a reader move from loving to hating and then to sort of understanding a main character. That's exactly how I felt about Joel. I loved him in the beginning of the book: he was so kind and loving towards Mimi, his reasons for being a marine were heartfelt and he adored the ground she walked on. But then Mimi travels to Texas and meets Joel's brother Austin and his son Jake. This is where I began to hate Joel. The secrets he kept from Mimi, the lies and his actions towards Austin left no room for redemption in my mind. However, then we get Joel's points of view as he is struggling. The only thing that keeps Joel holding on is Mimi and his love for her. This is where I started having mixed feelings about Joel. The ending of the book really through me. Yes this is not a traditional happily ever after ending, however I think there is closure and the author does not leave you hanging. As I read each page, I kept hoping for a miracle and for what I thought was happening to actually not be happening but that wasn't the case. My heart broke at the end, but at the same time I felt some relief that Mimi had something to hold onto. I have been given an ARC in exchange for an honest review. The prologue of this book is very well written. The descriptions of 9/11 in particular are very accurate and bring the details of that day back to me. The first couple of chapters are quite choppy, so you have to stick with it as it does bounce from scene to scene. I wasn't sure I was going to stick with the book at this point, but there was something telling me to carry on. Once the story reaches the part where the main character, Mimi I have been given an ARC in exchange for an honest review. The prologue of this book is very well written. The descriptions of 9/11 in particular are very accurate and bring the details of that day back to me. The first couple of chapters are quite choppy, so you have to stick with it as it does bounce from scene to scene. I wasn't sure I was going to stick with the book at this point, but there was something telling me to carry on. Once the story reaches the part where the main character, Mimi is told that her husband is dead the scene changes even out this is when I really became drawn into the story. The events that led Mimi to go to Texas to meet with her estranged brother Austin are extremely emotive and well done. It soon becomes clear why Mimi becomes involved with the gorgeous Austin. There were parts of the book that left me feeling short of breath because of the emotion involved. This is not a story for somebody looking for a HEA, but certainly one for on your edge of your seat emotional roller coaster. I LOVED this book! The ending took my breath away. I hope Hollywood picks this up because it would make a phenomenal movie. Not all stories have a happily ever after. This one left me sad but hopeful. Looking through my library for a light read I accidentally opened this one and was captured from the first sentence. Does one really ever know the person they married is the question that begs an answer. Its the one that is constantly asked throughout. This book will take you on a wild ride. From happiness to heartache to happiness then heartache again. Prepare to feel so many emotions while reading. Then the end. WHAT!?!?!? A great romantic read that is full of angst. Ms. Slough will keep you guessing on what will happen next. I love this book, taking twists and turns it made me cry a few times. The last chapter, of just one page, I think ruined the whole book that I’d just sat and read. Too much of an abrupt ending. Quite disappointed. This book isn't what I expected it to be, but not in a bad way. There were a few teary eyed moments, and for those who know me know I hate to give spoilers. So let me give you what I can, marine, which always get me because who doesn't love a man in uniform, a hot cowboy from Texas (I had to ignore that some family lives in Texas) and plot twist gnat had me not only question the lies that could be told to me, hidden from me and just lurkin to come out. I rooted hard for who I believed in for the relationship, but unfortunely wasn't successful. It had me worried for my significant other who aims to go in the military, and made me see that sometimes life had a plan of its own. Excellent read, debut is just he beginning of something great. Hopefully next time the book won't have me questioning everyone for their honesty and lives. I will be honest and say that the book didn't hold a lot for me near the end. I didn't struggle as much as some did in other reviews have stated, but the ending was just traumatizing. It's not a spoiler, but its a sensitive topic that had to be said. I don't do spoilers my people know this! But it it was sad and I wish I could have closed the book and pretended I got the happy ending I wanted. Don't get me wrong, it was a good story and for a debut book the writing was immaculate and the book was throughly thought out and clearly given a lot of love and attention, which I appreciate for the sensitive topics in the book. I'm just a happy ending person in romance books, other genres I expect endings that rip my heart out. It was a surprise for the romance genre to me. The book is a good read, remember t's okay if you are a happy ending person. I cried, mostly out of fear and respect for those I know in the military. I still REALLY hope next time the book won't have me questioning everyone for their honesty and lives! The minute his brother's widow shows up on his doorstep Austin Marcus can sense that trouble is about to hit, she is here to learn more about the husband she just lost, but Austin can't bare to share secrets that aren't his to share. Soon he finds himself falling for Mimi, and an affair ensues, but before things can ever really get going, his dead brother makes a return home, and he knows it's just a matter of time before he loses the woman he loves...to a man she never really knew! This stunning debut grabbed my attention from the get-go and had me flying through the pages for some much needed answers, and boy oh boy did I find them and so much more! After reading the synopsis for this one I thought I knew where the story was going, but I received the shock of my life when things went in an direction I never saw coming! This story had it all, spine-tingling suspense, steamy romance, and a gut wrenching emotion that hits at the core!! If your looking for something that will give you the feels and keep you on the edge of your seat the whole way through, then look no further, this is the perfect read for you!! This story isn’t what I expected but it’s enthralling and I couldn’t put it down until I’d finished. At the beginning I expected a supernatural element but the story’s twist, is more down to earth, yet keeps you guessing and gasping right to the end. Mimi and Joel’s serendipitous meeting and whirlwind romance is like a fairytale. Joel’s imminent deployment to a war zone is the only darkness on their horizon. Mimi’s heart rips apart when the unthinkable happens. With more questions than answers when her best friend offers her a lifeline, she grabs it. Meeting her husband’s estranged brother really blows her life apart. The characters are complex and force you to take sides. Fast paced, the plot is full of surprises and interwoven into the intricate story, romance gives sweet relief to the angst and darkness. Full of impact the ending devastates but the hopeful little twist at the very end made me smile. What do you do when the live of your life dies? For Mimi it meat leaving London and traveling to Texas to meet the brother-in-law she never knew and find out about the life and childhood her husband never really told her about. But when she gets there she uncovers that her husband may not have been quite the man she thought he was. As she begins to sort through shocking revelations and begins to have feelings for Austin little does she know that the most difficult test yet is right around the co What do you do when the live of your life dies? For Mimi it meat leaving London and traveling to Texas to meet the brother-in-law she never knew and find out about the life and childhood her husband never really told her about. But when she gets there she uncovers that her husband may not have been quite the man she thought he was. As she begins to sort through shocking revelations and begins to have feelings for Austin little does she know that the most difficult test yet is right around the corner. Reading the synopsis for this book you know that a love triangle is in store for you but it's all the little pieces that make the story something you just have to uncover. Mimi is just to find her way through her grief and she's one to follow her heart even wanna take her an unexpected directions. Joel is the strong noble military man, but when his secrets start to come out you see who he really is. Austin is a total sweetie. I fell in love with him right from the start and loved how he would wear his emotions on his sleeve so you never questioned him. The story takes many twists and turns and you follow predominantly through the eyes of Mimi as she sorts out where her feelings truly lie. If I’m honest I was expecting a run of the mill romance from this book. The cover belies what is within. I’m astonished tihs is Christina’s debut novel because it is so in-depth, pulls at the heartstrings and has an overwhelming amount of information. I felt as though I was listening to a Military wife at times. The story centres around Mimi and Joel initially but then involves his brother Austin. Mimi is so desperately in love but her world is shattered when Joel is deployed to Afghanistan. The If I’m honest I was expecting a run of the mill romance from this book. The cover belies what is within. I’m astonished tihs is Christina’s debut novel because it is so in-depth, pulls at the heartstrings and has an overwhelming amount of information. I felt as though I was listening to a Military wife at times. The story centres around Mimi and Joel initially but then involves his brother Austin. Mimi is so desperately in love but her world is shattered when Joel is deployed to Afghanistan. The tension mounts throughout the book, so many twists and the author isn’t afraid to shy away from the inevitable happy endings .. I found that rather refreshing. I really enjoyed the descriptive writing .. I have been to Yosemite and could feel myself transported back there during that scene. The recap about 9/11 hits home and its so true everyone remembers where they were. A variety of characters keep the whole story flowing and each brings a distinct image to mind. Yes there is a love triangle but once some secrets are exposed you are drawn towards one brother over the other. I really enjoyed this and look forward to more books by Christina. Wow what a book! This was a very good military romance story. There was plenty going on to keep the pages turning! There were even a couple of whoa, didn't see that coming moments! I loved the multiple points of view from each of the characters involved in the story. This added so much depth and other views to the story! Mimi is a newlywed military wife. Joel is in th I was asked for an honest review free of persuasion from the author or anyone else affiliated with this book. Mimi is a newlywed military wife. Joel is in the marines. Joel leaves on his second deployment to Afghanistan 1 month after their wedding. Mimi chooses to stay in England with her family while Joel is deployed. One day Mimi gets that dreaded phone call. The one where the military informs you that your husband has died. Mimi fights severe depression at this news. Her best friend convinces her to go to Texas. Texas is where her husband is from and might help Mimi find closure. What Mimi finds is a lot more about her husband than she ever knew. What did Joel keep from her? What else did Mimi learn while in Texas? How is her life forever changed? Hot military guy, smoking hot cowboy, what the hell is not to love? Actually, not all is what it seems. Brit Mimi marries US marine Joel, and I quickly fell for Joel within the first couple of pages. However, after a lot of tears, twist and turns start to unravel within the story and along with that and the writing style, it kept me on my toes! The story gave me shock after shock and I did not see any of it coming! Joel is not the man he first makes out to be and I’m glad he was exposed. Now we Hot military guy, smoking hot cowboy, what the hell is not to love? Now we get to the hot cowboy. Austin - How hot are you? Sigh. Austin is Joel’s brother, a brother Mimi has never met because of a family feud. I can’t tell you why, but Mimi travels to Texas and falls for Austin. I mean, of course she does! So did I! Team Austin all the way. Austin is moody, aloof, and hot as hell comes and that’s just what I like. But he also has a softer side and I loved that Mimi brought that out of him. There are so many twists and turns in this story that I can’t say much more because it will give the storyline away. But what I will say, THAT ENDING! I still haven’t forgiven Cristina Slough for that ending. And I don’t think I ever will. I loved it! Go read it already. The first thing I noticed about this novel was how well Slough handled the military family/deployment issue. Not sure if she has a military background, but I do, and I was able to relate immediately with Mimi’s feelings about her husband deploying for Afghanistan. She nailed it. I must agree with the other reviewers, do not expect your standard “happily ever after” ending with this novel. It’s definitely not your typical, run-of-the-mill romance novel. It’s full of suspense, twist, and turns and The first thing I noticed about this novel was how well Slough handled the military family/deployment issue. Not sure if she has a military background, but I do, and I was able to relate immediately with Mimi’s feelings about her husband deploying for Afghanistan. She nailed it. I must agree with the other reviewers, do not expect your standard “happily ever after” ending with this novel. It’s definitely not your typical, run-of-the-mill romance novel. It’s full of suspense, twist, and turns and an ending that will blow your mind (in a good way). I certainly was not expecting it to end that way. Slough’s writing is professional, very descriptive, and easy to follow. If this is her debut, it doesn’t read like one. It reads more like a story woven by an experienced veteran of the industry. I can’t say much more without giving away the plot and the ending, but trust me when I say that you should follow your instinct and buy/download this novel today. Like me, you’ll have it read in less than a week and you’ll be on here singing Slough’s praises, too. Cristina Slough is a Women's Fiction author. Her debut: Till Death Us Do Part was released in December 2015. Her second novel: The Life She Left Behind is available for purchase now. Cristina writes about raw human emotions, and subject matters that are very real to women.